« Windowfarm update: tiny sprouts! Once you get your worm bin up and running, you will fall into the happy rhythm of saving/freezing your scraps when you cook and adding them to your bin once a week. The bin has a sort of magical quality to it where it seems like you can just keep adding food scraps and it never seems to fill up! Of course, that is because your worm friends are hard at work breaking it all down into a much smaller volume. 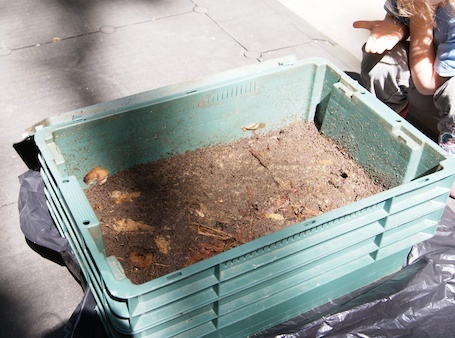 But eventually (as in 4-6 months) you will notice that your bin does start to fill up and there is quite a bit of compost in there to be “harvested” – but how the heck do you separate the worms from their castings? Good question! Open your bin and you will likely see a combination of compost and foods that haven’t quite finished breaking down. 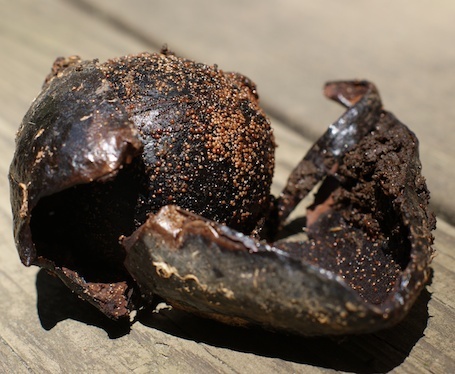 Avocado pits and eggshells are notorious for taking a long time to disintegrate. If you have a large percentage of recognizable food scraps that need wormy attention, I suggest you let the bin sit for 2-3 weeks before harvesting. Unfortunately though, that means not adding to it for those weeks. If you have two bins, you can stagger them, so you always have a place to put your scraps. Otherwise, you will need to find an alternative during this time – or take a vacation! gloves if you don’t want to get your hands dirty. The optimal situation would be to harvest your bin in the garden where you plan to use your compost. That way you can spend your afternoon both gardening and composting, since there is quite a bit of unattended time required. If you don’t have a sunny outdoor garden (which might be why you opted for a worm bin in the first place) have no fear! This process can also be done in your plastic lined bathtub! What you see here is a combination of worms, compost, and a few bits that just haven’t broken down yet. Beautiful, isn’t it? The first thing to do is to pick out the avocado pits, corn husks, eggshells and other items that need a long time to break down and set them aside. 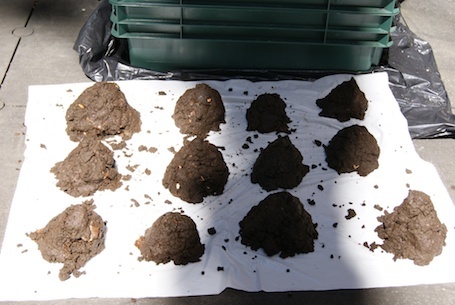 Then, take the compost and divide it into small pyramids. Note: Kids love doing this. 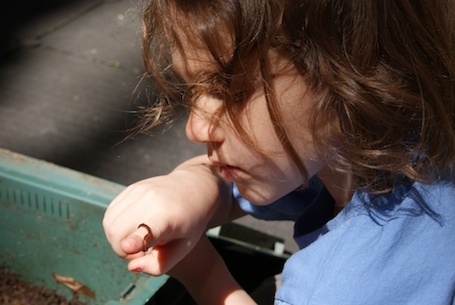 You see, worms do not like light – and will do their best to avoid it, so doing this on a sunny day will yield the best results. If you are harvesting indoors, you can use a flashlight or set up a utility light to mimic the sun. Once you make your pyramids, wait a about 20-40 minutes (during which you can garden, read a book, call your mother…) and the worms will make their way down to the bottom of the pile. Start by removing the top and sides of the pyramids and putting them into your compost bucket. Reform the pyramids and wait another few minutes. Repeat this process and soon you will just have tiny piles of mostly worms and some compost. 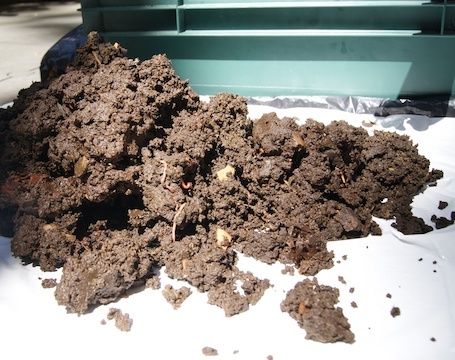 To be certain, you will also find there are worms in your finished compost, and I don’t think that can be avoided. Think of them as an extra bonus to the plants. 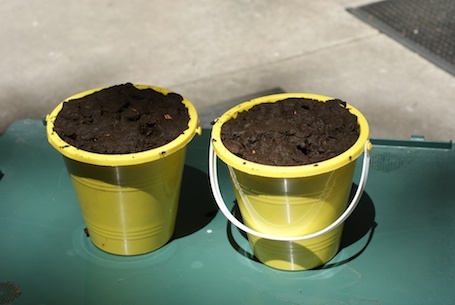 You should now have a nice supply of finished compost – black gold! You can put it directly onto your indoor and outdoor plants – just add them to the top of the soil just around the base. If you have extra, you can donate it to a community garden, or put it into some fancy packaging and sell it on Etsy! 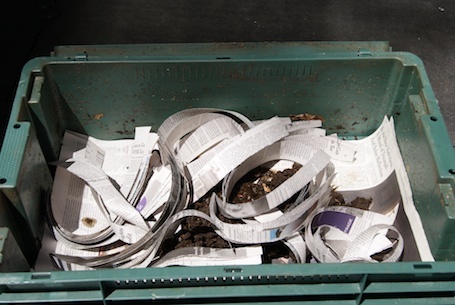 To start your worm bin anew, just clean it out and make a fresh bed of shredded newspapers. A little creepy, but also sorta cool! There are a few other methods to harvest a worm bin here and here. But the pyramid method has worked best for us. And I can’t recommend highly enough the handy reference guide, “Worms Eat My Garbage!” for an even better explanation of how this all works. If you have any tips on how you successfully harvest your bin, I would love to hear about them. This entry was posted on January 23, 2012, 9:47 am and is filed under Compost, garden, Green. You can follow any responses to this entry through RSS 2.0. You can leave a response, or trackback from your own site. Getting back to the basics and making life better. This has been profoundly helpful for a greenhorn like me! Thank you for the info. What kind of worm bin is this? We’ve been happy with it. Good luck! I use a worm factory. This is such a helpful post for people out there still confused on when to harvest.